Julian ASSange’s appearance on Captain Cartoon’s radar has manifested in the form of two new Wikileaks cartoons produced by the South Florida cartoonist. The first cartoon shows Assange in the presence of a naked state department “fat lady”, with the Wikileaks flounder himself holding her dress. No effort was made to actually I-D the pictured lady, but one can make an educated guess as to who she is supposed to be. “The fun part was actually trying to envision Hillary Clinton naked,” says the cartoon Captain. He once photo-manipulated her image by throwing (stuffing) the former First Lady into a bikini during his Weekly World News days. 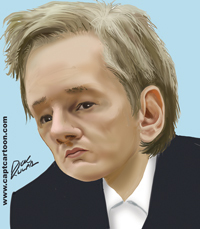 The Captain followed up with a digital caricature of Julian Assange, (shown above), drawn with his Wacom tablet onscreen. “I really wanted to capture his ‘pouty, spoiled brat look,” says the Captain. Vehemently opposed to the unauthorized publication of stolen documents, not to mention the rippling, crippling effect that action will have on our country’s ability to “do business,” Captain Cartoon plans more cartoon commentary on the Wikileaks subject. Both cartoons have been posted on Captain Cartoon’s website for free use.